If TMS has ever crossed your mind, I’d suggest you give it a shot. During my time as a TMS Technician, I have been able to witness the benefits of TMS. For those who have lost hope, deep TMS can be a valuable tool in overcoming depression. Those going through TMS treatment notice improved sleep, better levels of concentration, and overall enhanced mood as depression symptoms lift. In order to gain the greatest benefits from TMS, many of our patients set goals to work towards during their treatment. I have noticed that those who choose to improve nutrition and lifestyle, tend to have better outcomes. Recently I had a patient who was dealing with severe depression. This person had lost interest in nearly everything, would only eat once a day, did not exercise, and would limit interactions with others. Upon coming to Achieve TMS, we decided to set goals to try to overcome these obstacles. One goal was eating healthier and exercising regularly since they had been isolated and in bed for several months and had gained weight. We decided to start off with small steps — only 1 hour of exercise in the first week and limiting fast food intake. As treatment progressed, we added new goals. When treatment ended, this patient had lost 20 pounds and was eating healthy, balanced meals. Sleep, mood, and concentration all improved and this patient even went back to work after being unemployed. It is important that patients do their best to push themselves in order to get the most out of this experience and achieve their goals. Going through TMS treatment can be a challenge for those who feel they are alone, but we have a great staff at Achieve that offers support. 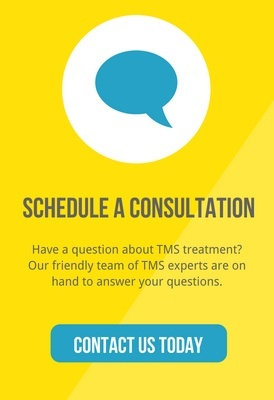 If you know anyone who has been dealing with drug resistant depression, please encourage them to give TMS a try — they will not regret it!